↑ Roger East, Richard Thomas (2003). Profiles of people in power: the world's government leaders. Europa Publications. p. 7. ISBN 1-85743-126-X. ↑ Dalila Belkheir and Khadidja B. 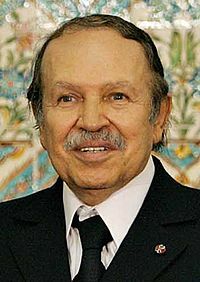 "Bouteflika : Maquisard, Ministre et Président de la république". Ennahar Online. สืบค้นเมื่อ 27 August 2011. ↑ "Abdelaziz Bouteflika." NNDB: Tracking the Entire World. 2011. Web. 23 Feb. 2011. .
หน้านี้แก้ไขล่าสุดเมื่อวันที่ 4 เมษายน 2562 เวลา 15:17 น.